As an advocate of positive reinforcement training (R+) and wholesome species-appropriate nutrition, I have somewhat of an unhealthy obsession with searching out the best doggie treats for rewards! 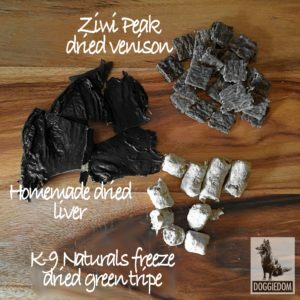 So rather than let my OCD-found wisdom go to waste, here’s my tips on the top things to consider when selecting healthy training treats for your pooch. 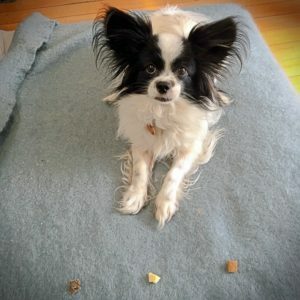 You’re hardly going to get far with your (R+) training if your dog is not particularly enraptured with the treats you are offering him as a reward. So first and foremost, select treats that your dog really enjoys and wants to work for (noting all remaining points below… .). You’ll know when it is something she goes crazy for when just the mere whiff sends her into a mini rapture of tail wagging, body spinning joy! Your dog may really love those supermarket treats you’ve been getting him, but have you checked the ingredients list? Maybe it’s all those sugar, flavours and additives that are giving him an unhealthy hankering. 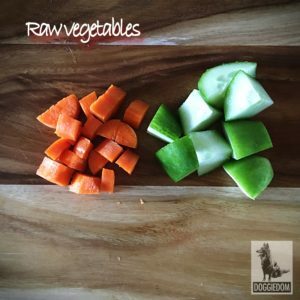 You’re going to be giving your dog lots of rewards to mark those desired behaviours in a training session, so those nasty sweet treats are going to have an impact on your dog’s health and waistline before too long. 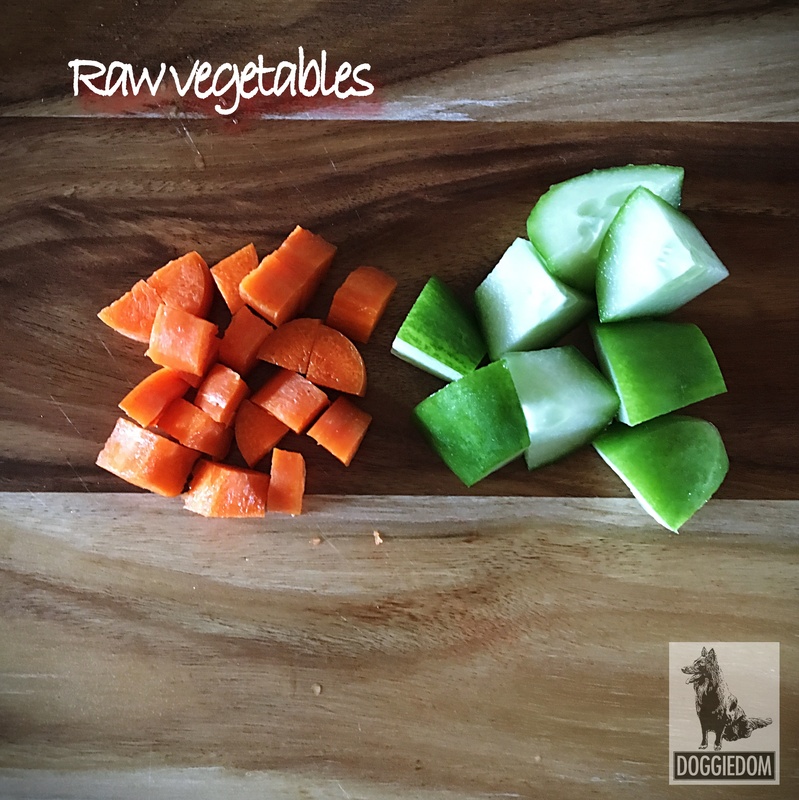 Instead, opt for foods that are as close as possible to their natural state (ie: minimal processing), are suited to your dog’s physiology (see Making your own dog food) and no nasty additives. They are usually much more pliable too and easy for your dog to gobble. I have some examples of my favourite doggie treats that meet these criteria further below. For most dogs, different food treats have different ‘values’ (okay Labrador guardians – your dog may well just find ALL foods valuable!). Both my dogs go crazy for roast chicken – it would be their $50 bill to give you a relatable analogy. But green tripe (super fresh and stinky) would undoubtedly be their $100 bill. They can barely contain themselves. I use the latter for really, really difficult training tasks though – green tripe is not exactly the most pleasant food treat to mete out – (rubber gloves highly recommended for that one)! Which treat will Rupert choose first? 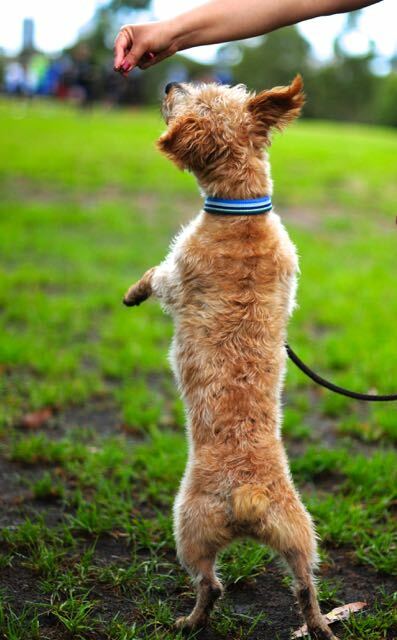 To work out your dog’s ‘value hierarchy’, you can layout a number of different food treats on the ground (while restraining him of course – unless you have a reliable sit-stay….) and set him loose on them. Try it a few times, mixing around the order of the treats to see if there is a genuine order of preference he goes for. If there’s no order and he just gobbles them all up randomly, then that’s fine too. Obviously if he rejects any, they come off the list. Another important quality to keep in mind with your dog’s food treats is that they can be broken or cut up into teeny-tiny pieces. This is particularly important for teaching new skills to your dog, where you will be feeding rewards at high repetitions. You don’t want to fill your dog up too quickly nor be responsible for a bulging waistline. 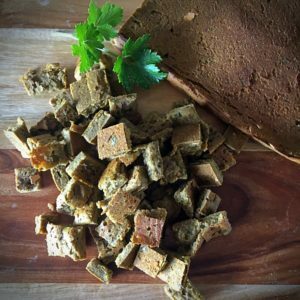 On that note, the other benefit of using wholesome real food treats is that it can count toward your dog’s daily food intake without compromising nutritional balance. Now that’s a win-win! These are a few of my favourite (doggie) treats…. Need to ensure proper hygiene when handling raw meats – wash hands thoroughly as soon as possible! Many commercial dried treats are filled with ingredients that are not in the best interest of your dog’s health (eg: sugar, artificial colours and flavours) – check the ingredients or better still make your own! 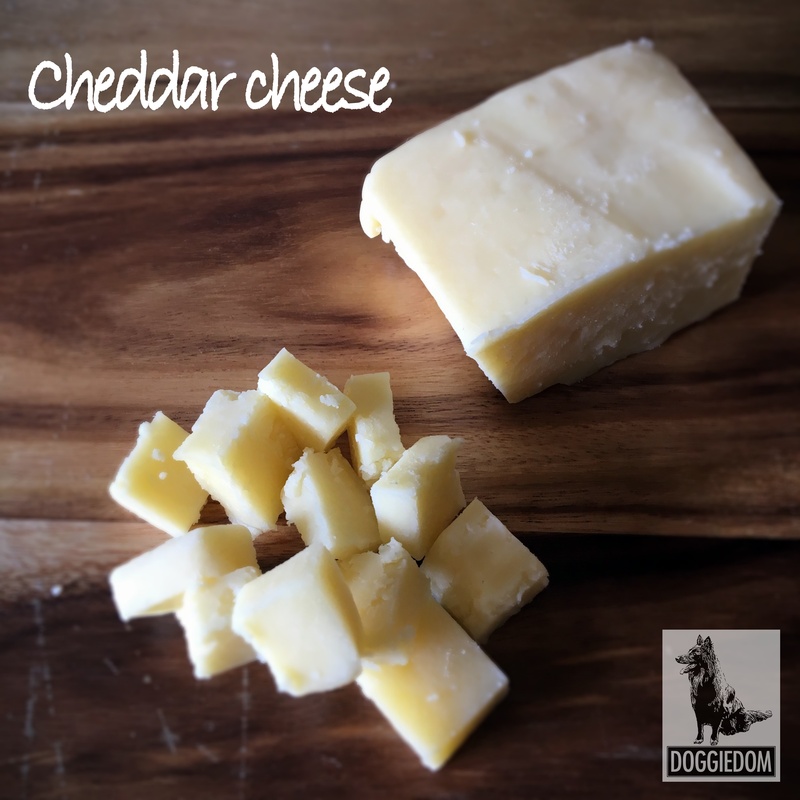 Still need to be used in extreme moderation as too much cheese can cause digestive upset – again, use occasionally as a high value treat if your dog tolerates dairy; choose a more digestible form such as goat or sheep milk cheeses. Anything heavily processed! 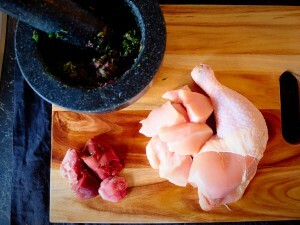 Read the ingredient label and avoid anything that has ingredients other than meat. Any kinds of foods that are toxic (obviously!) like chocolate, macadamia nuts, onion (yep, these could be a treat for some dogs! ), grapes. Human or pet food grade processed meats (like devon, bacon, hot dogs); these foods have been strongly linked to cancer, particularly in large quantities!